Having a child who was recently diagnosed with Asperger’s; an autism related disorder, I thought I would be able to relate to the book, The Castle We Called Home, Our Living, Breathing and Emerging with Autism. I know how challenging life is taking care of a special needs child. However, I can not imagine what Simone Brenneman went through raising two children with Autism. Her first book, Effervescence: A True Life Tale of Autism and Courage is about raising her autistic daughter, Genevieve. Having not read that book I wasn’t aware of Simone’s writing style. 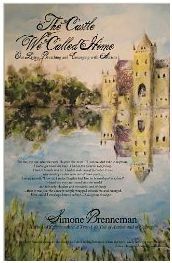 I was told that The Castle We Called Home is a novel about a mother’s quest to connect with her Autistic son. Most novels that I read are stories told in the third person point of view. Novelists are very descriptive and as you read you are able to picture the scenes in your head as if you are watching a movie. This is why I love novels so much. Simone Brenneman is not a novelist. I had a difficult time connecting with the story she was trying to tell in The Castle We Called Home. It reads more like a diary than a novel. If she really wanted to tell the story about her Autistic son she should have presented this to a true novelist. She writes in the first person point of view as if she were answering interview questions. I did not see any vivid descriptions throughout the book unless you think that repeating the same words over and over again is descriptive. In the first few chapters she uses the words, epic, bizarre, and magical repeatedly. Simone calls her story dealing with her son an “epic tale,” which she also repeats over and over again. Even after reading the book I still don’t see how raising an autistic boy can be an “epic tale,” especially in the way that Simone writes it. According to dictionary.com epic is, “noting or pertaining to a long poetic composition, usually centered upon a hero, in which a series of great achievements or events is narrated in elevated style: Homer’s Iliad is an epic poem.” I still don’t understand how her son Hayden became a hero. I also did not like the fact that she repeats the same stories and emotions over and over again. Her chapters are short and choppy averaging about 3-5 pages per chapter. Some chapters do not even cover a whole page. I found the book dry, repetitive and uninteresting. The Castle We Called Home, Our Living, Breathing and Emerging with Autism should be more appropriately titled, The Castle We Called Home, A Mother’s Diary About Raising a Son With Autism. That is what this book really is; a diary. You can purchase The Castle We Called Home on Amazon.com or find it in your local bookstore. *Disclosure: I received a copy of the book, The Castle We Called Home: Our Living, Breathing and Emerging with Autism in exchange for this review. All opinions are accurate and 100% mine. Related Hey Sugar, Sugar, Sugar!